This week, Brandon Matzek of Kitchen Konfidence joins us to share his love of infused alcohols. Three years ago, I was amidst the planning stages of a big backyard bash when I decided that I wanted to provide my friends with a cocktail option other than the standard cosmo or vodka cranberry. With thoughts of a crisp cucumber martini in mind, I made my way to the liquor store in search of cucumber-flavored vodka. To my dismay, I couldn’t find this particular flavor anywhere. Defeated, I drove home from the store trying not to look too disappointed at the vodka and cranberry juice sitting beside me. The next day, I picked up my CSA from the market to find a beautiful bounty of ripe summer produce with a surprise at the bottom: a cucumber. A firm believer of the “everything happens for a reason” methodology, I promptly peeled and diced the cucumber. After tumbling the pale green cubes into a mason jar, I turned my bottle of vodka upside down, unleashing a tempest of splashing alcohol. Glug after glug sloshed around the jar until the last drop fell from the bottle. After 5 days, I had my cucumber vodka. Since that memorable backyard bash (with fab cucumber martinis), I’ve been obsessed with making my own alcohol infusions. The process is fairly simple, and the results are usually spectacular. This blueberry basil infused vodka is no exception. Made with simmered blueberries and leafy basil, this infusion captures the essence of summer -- fresh, light and wonderfully fragrant. The blueberries provide a familiar base note to the vodka, while the basil lends complexity in flavor and aroma. • Start with good ingredients. Using ripe, in-season produce will give you the best flavor. If organic produce is not an option, be sure to thoroughly wash regular produce. I would recommend making your infusions with good quality alcohol. Bottom shelf products will impart an unfavorable flavor. Top quality alcohol is fine to use, but a waste of money. The infusion process will alter or mask any nuanced flavors the alcohol may have. In regards to vodka, I like to use Skyy or Absolut. • Timing is everything. Herb infusions only take 1 to 2 days. Fruits and vegetables can take up to 7 days. Dried spices up to 14 days. • Taste as you go. A good portion of this process is to taste. I would recommend tasting your infusion each day to learn how different ingredients function in alcohol. When tasting, don’t do a shot! Spoon some of the alcohol from the jar and slowly sip. Roll up the sides of your tongue and let the alcohol move down the middle. This method will allow you to experience the flavors of the alcohol with minimal burn. • Experiment. If you are just starting out, try experimenting with vodka. Vodka has no taste, so it takes on the flavor of whatever you pair it with. Check out these citrus, fennel and bacon infusions for some inspiration. Once you’ve mastered vodka, try infusing more complex alcohol like tequila, bourbon or gin. Strawberries lend a sweet-tart note to smoky bourbon. Peppers provide a fresh grassiness to peppery tequila. You can also try blending two flavors into one alcohol. Classic flavor profiles translate well when making infusions. Cranberry-orange. Lemon-thyme. Apple-cinnamon. All delicious. • Do a test run. Unsure if peach and mint will work with Jack Daniels? You can test out a flavor profile in advance by placing a small amount of each ingredient in a glass. Muddle everything together, strain, then taste. This method will give you a general idea of how your finished product will taste. • Mix it up. Infusions usually need a little sweetness and acid to perk up the flavors. Try using honey, simple syrup or agave nectar to bring out the sweet notes of an infusion. Freshly squeezed lemon or lime juice can be used to balance out the sweetness. Enjoy this simple cocktail on the rocks or add a little snap with sparkling water. 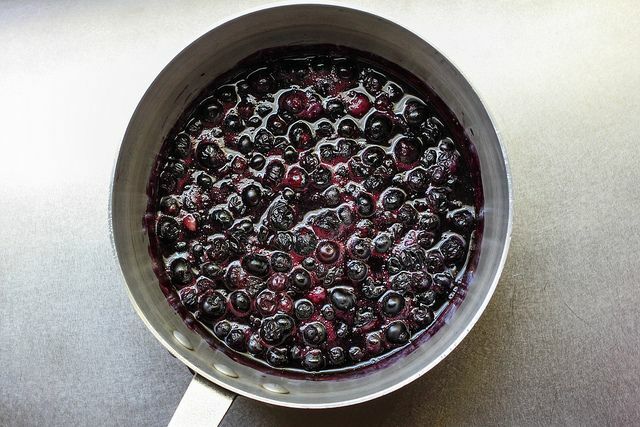 Give the blueberries a good rinse, then add to a large pot (no need to dry them). Warm blueberries over medium heat, stirring occasionally. Cook blueberries until they release a decent amount of liquid. You can eyeball this step. I stopped cooking the blueberries once more liquid was visible than solid berries. Cooking the berries this way speeds up infusing times. Remove from heat and let cool to room temperature. 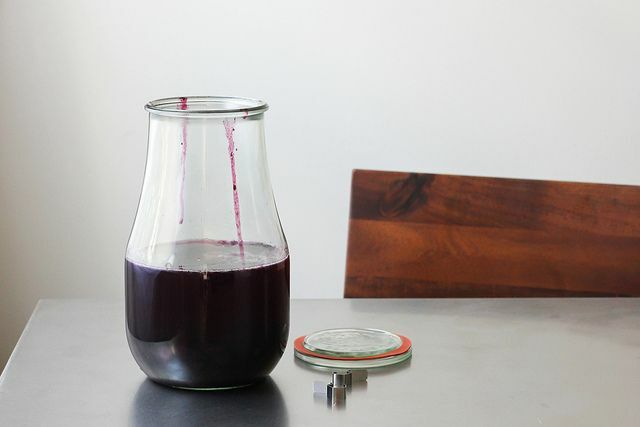 Add blueberries with juices to a large, airtight jar. Pour in vodka. 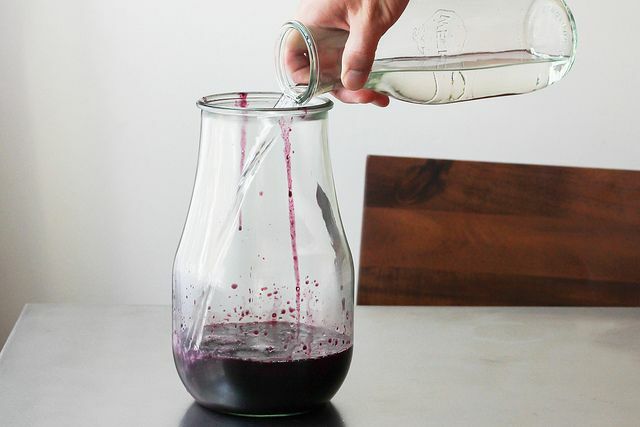 Seal the jar and store in a cool, dark spot. Each day, give the jar a little shake, then taste the vodka. As the days go on, you’ll notice that the blueberry flavor will get stronger. I was pleased with the flavor after 6 days of infusing; however, this can vary based on taste. 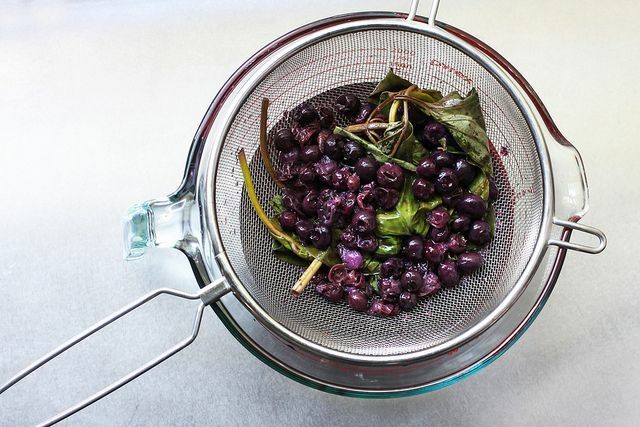 Once you are satisfied with the blueberry flavor, stir in the basil leaves. 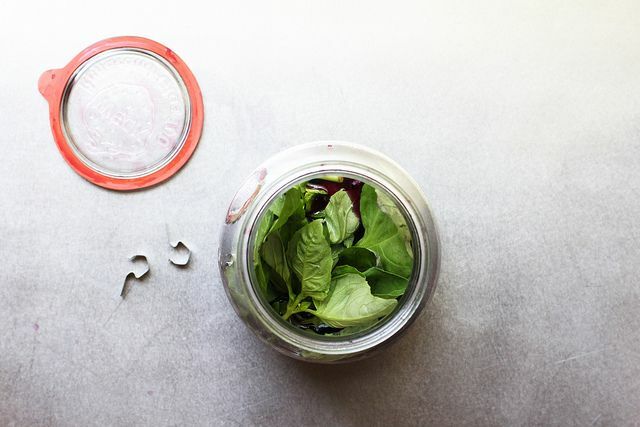 Seal the jar once again and store in a cool, dark spot. 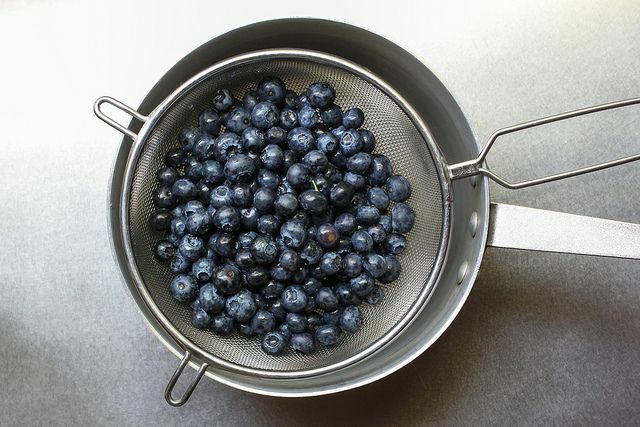 After 24 hours, pour the mixture through a fine-mesh basket strainer into a clean bowl or jar. Discard the solids. The more solid matter that you strain from the vodka, the longer the alcohol will last. I find that I use up my infusions several weeks after making them, so I’m fine with a single strain. If you are planning on keeping this infusion for an extended period of time, line the strainer with several layers of cheesecloth, and strain again. Brandon will be answering questions about infusing on the Hotline for those of you who want to take on this project at home. For the quickest response, go to his recipe and ask a question from there -- we'll email him your question right away! Be sure to check in next week, when Cara Eisenpress will help us preserve our end-of-summer bounty in the form of sun-dried tomatoes. Kitchen Konfidence is a collection of recipes and techniques aimed to inspire the home cook to do more in the kitchen. About Brandon: I enjoy cooking with seasonal ingredients, making ice cream and shaking up some killer cocktails. When I am not cooking and taking pictures of my food, I am at the beach, carousing with friends, taking day trips up the 5, or engaging in all manner of computer geekery. Hi Tony, other than chopping (and sometimes peeling), I don't do anything to the cucumber. beautiful jar. looks wide enough to get my hands in there for cleaning. Did you order that online? When I infuse cherries in bourbon (i. e., make Cherry Bounce), I refrigerate the cherries when they are done and use them in deserts and sauces for duck or pork. Has anyone tried using the blueberries after infusion? Cherry bourbon sounds delicious! I've found that most of the fruits and vegetables I use for my infusions don't taste too great afterwards. The alcohol extracts the flavor into the liquid, so there isn't much left in the solids! Brandon is the king of infusions and I look forward to trying this one. Miss seeing him on the old Foodbuzz. I don't drink but will morph this idea into infused syrups and Popsicles. Lovely! Great idea! I'm thinking blueberry basil jam would be nice too. Or maybe blueberry basil sorbet? Beautiful pics. I need to try this. Thanks for the recipe. I put this together tonight while making supper and now the waiting and tasting part begins. Gorgeous! Tarragon is also really nice with blueberries. 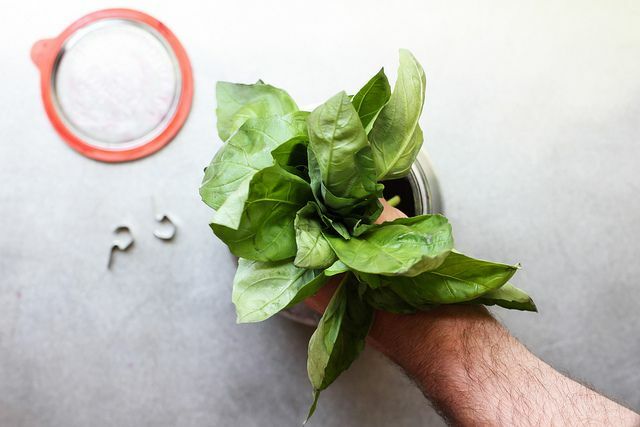 I'm about to plant some lime basil that I think would be great for this recipe. That would be a perfect addition! Sounds like a great combination for cocktails! Sweet blueberries and fresh basil must taste amazing. Can't wait to try this! I love the pictures, very colorful!